My friend, Linda, sent this picture to me. She said, "Here you go. This is my garden shed my husband and friend built for me. The original handle fell off and I got another friend to put this up instead. I stained the handle so it looked aged." It's amazing the things people come up with! We have an unattractive shed on our property, well, actually two of them that I'd like to spruce up like this. My poor DH. I'm always thinking up new things to do around the house. But the thing is, he's always saying, "Happy wife, happy life." Anyone else out there have a cute shed to show? I'm definitely in the market for ideas. Click here for a slide show by HGTV (love that channel) of some really inspiring garden sheds. Please leave a comment below if you have any ideas to share. We live on an old farm. 5 almost 6 acres. Our sheds need sprucing up to… Will be watching to see what you do. There is so much to do when you first move into a house. We've been here a year and have done a lot, but oh, so much more to do. Isn't it fun making a house into a home? 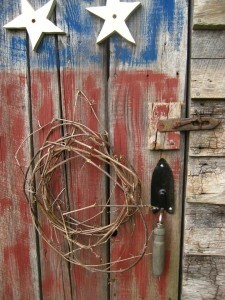 The picture above, of the beautiful garden shed is so great! I'd move into that small space in a heartbeat. Then maybe everyone would stop moving in with me!